Hari Raya is the rare occasion when Malay men get to wear a full body, complete set of our traditional Malay costume. 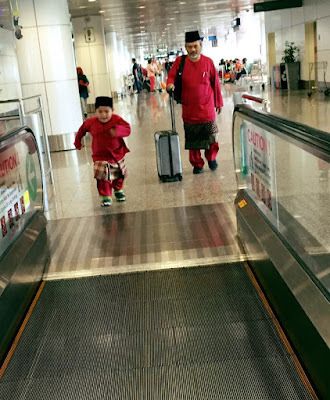 A complete set of Malay men's traditional costume is made of one set of Baju Melayu shirt and pants, a headgear called songkok and sampin*. And this year, Tariq and his dad have two sets of Baju Melayu Johor for Eid due to my cousin's wedding. So the First day of Eid, both my panglima (warrior) wore their champagne colored Baju Melayu. And on the second day, both wore a maroon Baju Melayu. So pleasing to my eyes. I have to say that I absolutely love our Baju Melayu traditional costume. 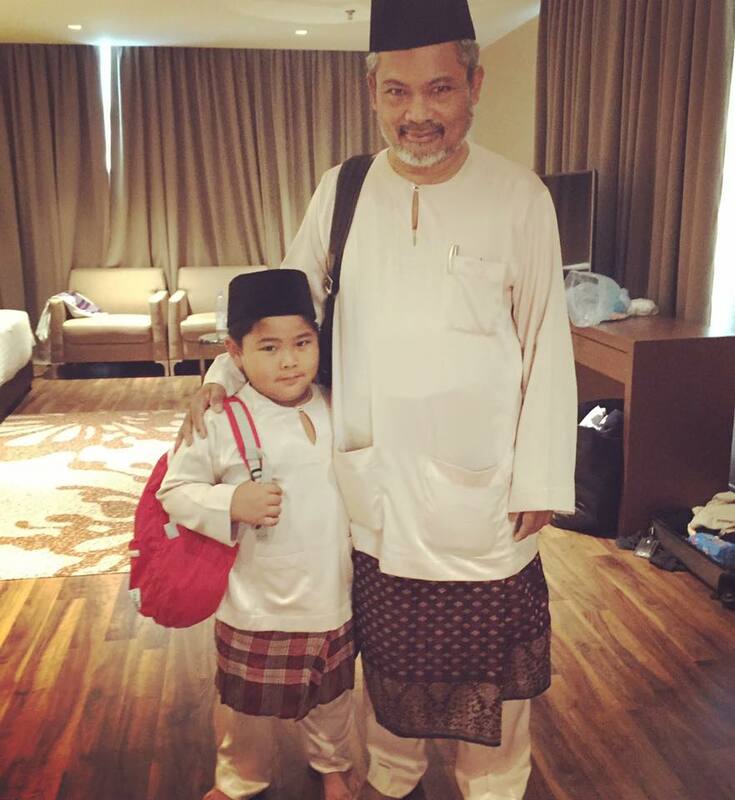 If I have have my way, both of them would have to wear the Baju Melayu everyday. ....We should continue this tradition. We should wear Baju Melayu for the first and second day of Eid because this is our custome. Our identity. Our tradition.. Yeay!! Thanks darling. You read my mind. So InshaAllah for next year onwards, I will have both my Panglima and our mini Panglima wearing Baju Melayu for first two days of Eid! *Sampin is a sarung-like cloth worn around the waist of the wearer. It adds color and a certain attractiveness to the Malay Baju Melayu costume without which it looks ordinary. It is an essential accessory, worn together with the Baju Melayu for completeness as well as for its aesthetic value.